I met Pavia Rosati for drinks one slightly soggy evening in London and told her of my upcoming trip to Tuscany. When she heard I was staying in Greve in Chianti, she became animated and made me promise to dine at Solo Ciccia (which roughly translates from Tuscan as "only meat"), Dario Cecchini's restaurant. Dario is a well known butcher in the neighboring village of Panzano. He has two restaurants opposite the shop, Solo Ciccia and Officina della Bistecca ("Workshop of Beef"). She'd been recently and described a free-flowing, anything-can-happen kind of evening: multiple courses of delicious meat dishes intermingled with a party and rock musicians. In a butcher's shop? Really? I did wonder. As it turned out, dinner at Solo Ciccia was a genuine highlight of our Tuscan trip. We anchored our three days in Greve around that dinner. For ease of reference, we took to calling Dario "the Rock Star Butcher." We booked the 9 p.m. seating. Dario invited us to come early to the butcher shop for aperitivi. We didn't expect to be greeted by music — lively tunes by Louis Prima, Frank Sinatra, and Dean Martin. Very Big Night. A table on one side was laden with fresh herbs, loaves of bread, sliced salami, bottles of Chianti, and large platters of crostini topped with lardo. Dario and his wife Kim extended us a very warm welcome, pushing glasses of wine in our hands. This was not the conventional hostess check-in. Everyone was warmly greeted. A group dropped in to say hello, not necessarily to have dinner. They had a glass of wine, a crostino or two. (I can still taste that lardo.) Babies were squeezed. We chatted to a group of Italian guys (lawyers, bankers, wine merchants) who meet regularly to drink wine and dine at Cecchini's. They love the food and that you can bring your own bottles. The earlier sitting at 7 p.m. had a few families — mostly American visitors. When they piled out, Dario greeted them in the street with a tower of shot glasses and a bottle of his own grappa. Instantly, it became a street party. 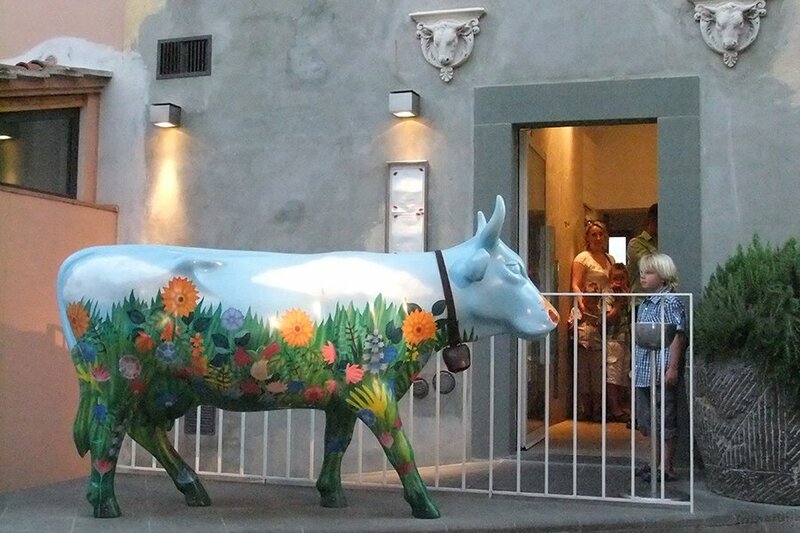 Children played and climbed up the large painted cow sculpture in front of the restaurant; we all mingled and chatted (no awkward cocktail party introductions here), enjoying the night air, getting more excited about our own dinner. When we did eventually sit down (it took some time to round up the diners from the street party), it was at a communal al fresco table with the Italian guys. The table overflowed with fresh vegetables for pinzimonio, carafes of wine, and Dario's own olive oil. And then the meal started. It was a set menu of nine courses, each dish a marvel in its own right of local produce and, of course, meat from Dario's shop. The Italians shared their special bottles, including a magnificent Brunello di Montalcino 1997. The meal ended with grappa (actually, a lot of grappa) and cigars, courtesy of our newfound chums. What I loved most about that evening, what I shall remember so fondly, was the warm hospitality of Dario and his team. He set the tone for conviviality with a great deal of bonhomie. It was just as Pavia had described it: anything can happen. I certainly hadn't expected to be dancing in the streets at a small village butcher's shop. Alpana works in travel PR, based in London. You can follow her on Instagram at @alpana.deshmukh. She travels for the thrill of new people, places, and experiences. But mostly for the food. She believes no mealtime must be wasted, least of all in mediocrity.